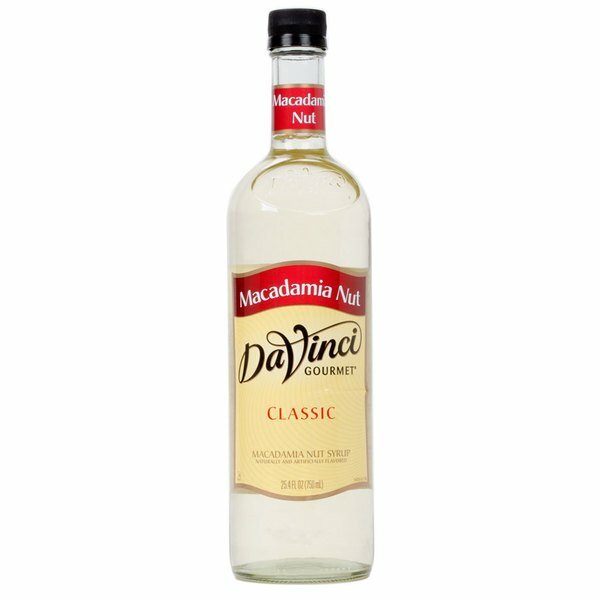 Choose from over 60 classic flavors, and discover the rich taste and quality consistency in each and every DaVinci Gourmet product, including this classic macadamia nut syrup! DaVinci Gourmet flavoring syrups are made from pure cane sugar to complement your beverages without overpowering them or being too sweet. They are specially formulated to resist curdling in milk and to hold up well under heat, making them the perfect choice for espresso-based drinks, brewed coffee or tea, and more. This syrup makes it easy to turn any beverage into an indulgent macadamia nut flavored drink! This syrup has smooth and natural taste, but doesn't overpower the fine components of your signature coffee. You can also drizzle it on cheesecake, or even add it to egg nog! One splash of flavoring syrup goes a long way, and flavored beverages enhance your menu with new, appealing items. This user-friendly bottle is easy for your baristas and restaurant staff to handle. 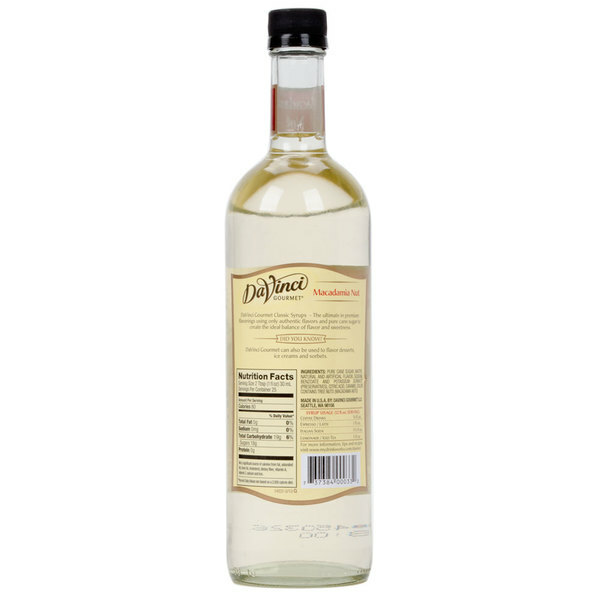 Sold in gourmet coffee shops, specialty food stores, food service outlets, and grocery stores, DaVinci Gourmet products, like this classic macadamia nut syrup, have a long history of commitment to quality and superior taste. I like the earthy hints of the syrup. I use this primary for my truckers special Chocolate Macadamia Nut frappe with boost. This drink is rich. This is a very good syrup and I have started using it to flavor some of my milkshakes a malts. The flavor is really good and can also be used to keep up the batter of my white chocolate macadamia nut cookies. Really experiment with this syrup because it is very versatile. This has a nice light nutty flavor. It is good in coffees and cocoas, whether hot or iced. It also helps to make terrific milkshakes. It just adds that extra something to the vanilla ice cream. I had to try it at home after a trip to Hawaii where i had some of the best coffee flavored with macadamia nuts ever, i was not disappointed and will be ordering this again to relive my moment on the island. The flavor was a bit underwhelming, but it could have been a bad bottle. Overall, DaVinci is a GREAT product and we will definitely keep ordering more. Most customers liked it in the Fraps, Coffees and Espressos. Great flavor. It makes a great cup of coffee. Mix it with other flavoring or by itself, it makes a great drink. Will be purchasing again..
Can we talk about how delicious this flavor is right now? I was hesitant because I've never been to a place where macadamia nut was offered as a flavor syrup but they should have this everywhere! It compliments coffee flavors very well. This flavor did not taste much like a Macadamia nut. It was not bad, it just did not taste like I expected it to taste. Our drink of the month was the White Chocolate Macadamia Nut Latte and it was a huge hit! People usually mix this flavor with another one, but it has an awesome taste all on it's own.